Sometimes there are safe short cuts. More often, however, short cuts are unsafe especially when dealing with electricity. 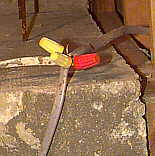 Improperly spliced wires, such as this one in the crawl space under a home, should be corrected as soon as possible by a qualified electrician.